Every business runs on thinking. This book gives you practical tools to assess others’ mindsets and get more intentional about how you use your thinking―and how to best engage the thinking of those around you. 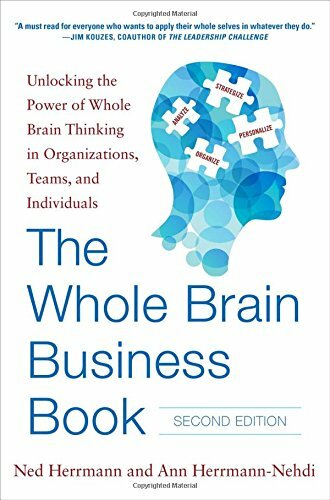 Filled with essential charts, engaging examples, exercises, and action steps, The Whole Brain Business Book shows you how to rethink your business, prepare for the future,realign your goals, and reinvigorate your team―by putting your whole brain to work. This revised and expanded edition features the latest brain research, updated real-world examples, and more actionable content than ever before. In addition to new stories, data and “mind-hacks”, you’ll find Herrmann’s timeless tips for getting unstuck, identifying the four thinking preferences, and applying research-based techniques that have been proven to work in any business environment around the world. By building and strengthening your thinking agility, you’ll be able to work more effectively with others―and leverage the best thinking around―so you can avoid costly delays, missed opportunities, and other business risks. Using the book’s point-by-point action steps, insightful case studies, and emerging thought trends, you can really put your mind to work―and get brilliant results.